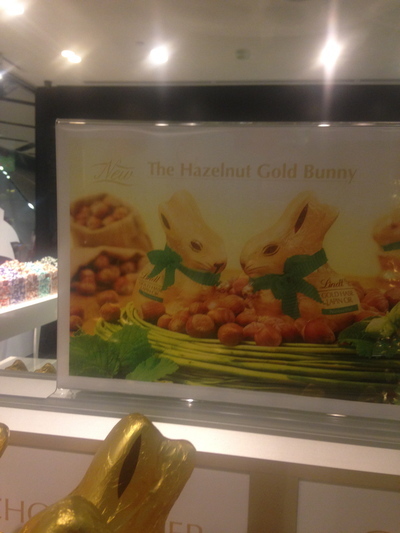 The beautiful new Hazelnut Easter bunnies. They will only be around for Easter 2014. They're only two weeks old, as at the time of writing this. 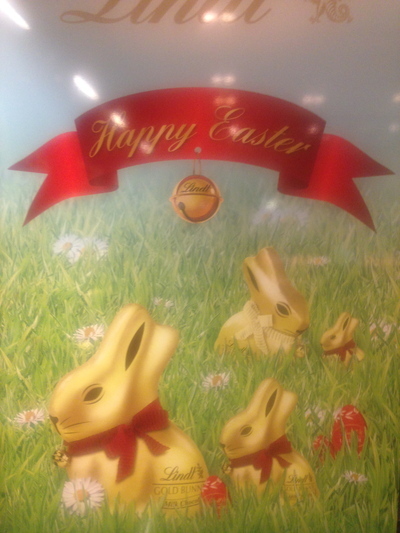 Magical chocolate paradise known as Lindt have just opened up their Easter Pop-Up Store in Westfield Sydney. In fact, this store opened on the 1st of March 2014. Today (as at the time of writing this one day later) I was able to check out the premises, and I am glad I did. Find yourself in the opulence and luxury that is Westfield Sydney on Level 4, and this Easter pop-up store full of chocolate treats is right opposite Bar Contessa - yes that end of Westfield Sydney with Laduree right nearby. 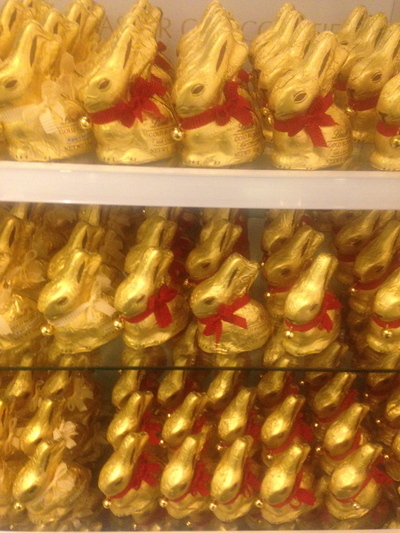 Easter bunnies galore. Love it. 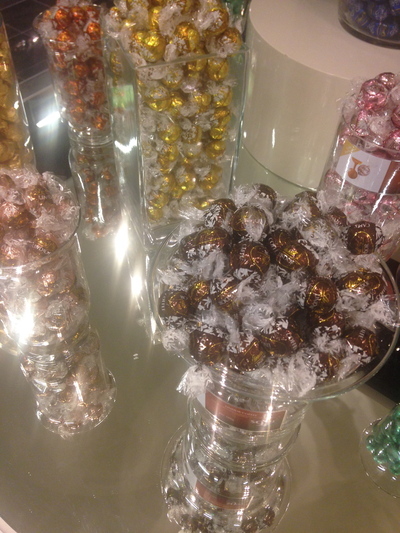 Loved how their traditional Lindor balls are on a cool window display, perched atop an elegant space. 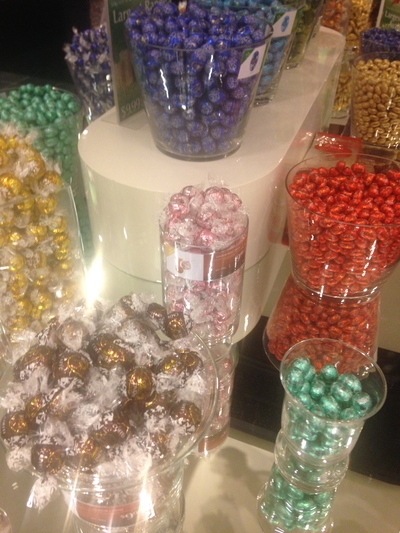 Of course, you will be able to purchase the same Lindor balls that you can buy at a Lindt Chocolate Cafe. 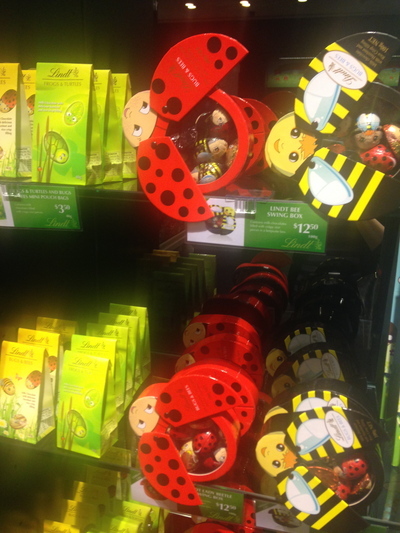 Exclusivity reigns, and this is something that Lindt fully pride themselves on. Many of the Lindor balls that you can buy here. You cannot purchase them at the supermarkets, or anywhere else in Sydney. 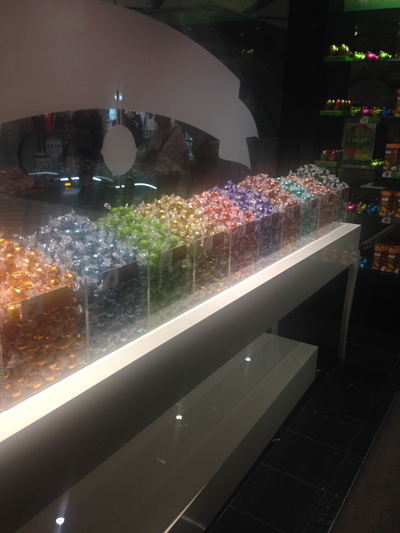 Some cool Easter treats, available at Lindt's newly opened Pop-up store at Westfield Sydney. I was welcomed inside by Katheryn, who apparently works as a Maitre at their flagship Martin Place cafe every Sunday and Monday; yet is working at this pop-up store at Westfield Sydney until it closes on the 21st of April 2014. We started chatting about working with chocolate, and I continued to browse the beautifully displayed and elegant chocolate displays. Pity I am on a gluten and dairy free diet at the moment (to clear the breakouts on my skin from recent work stresses), however that has been broken a few times over the last couple of weeks. Lindt is also partially responsible for that, but in a cool way. You are able to buy quality, melt in your mouth chocolate here. Some of the Lindor balls are in pre-made packs, while others allow you to pick and mix. Little pick and mix chocolate eggs are also available. I was fortunate to take a handful of these home on my chocolate tour yesterday, from what was left over after my 13 guests took some home with them during our time at Lindt Martin Place. 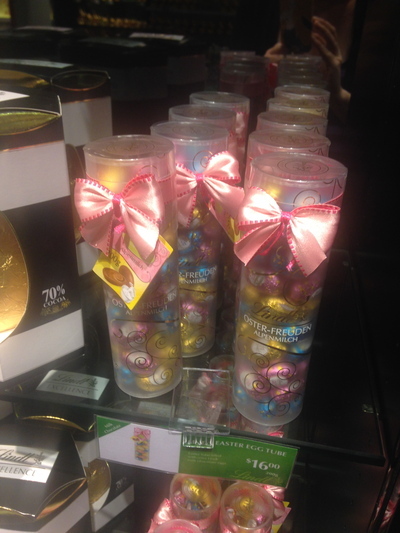 These little Lindt Easter eggs are adorable. They come in white, milk and dark chocolate, as well as in a beautiful coconut flavour. Love it how they're displayed in beautiful glasses here too. A beautiful message inside. Thank you lovely Lindt. 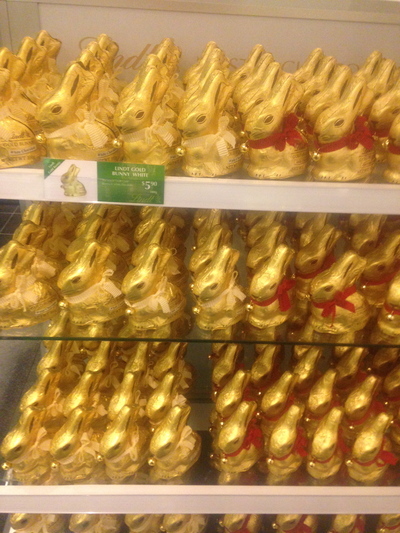 Of course, the traditional Lindt Easter bunnies are also available for sale here. You can buy one for $5.90, or two for $8. Such great value if you buy two. The traditional flavours of white, milk and dark chocolate are available - in white, red and brown bows with bells respectively. 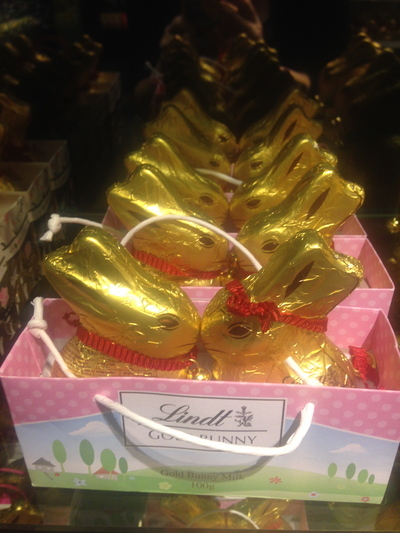 This year, Easter is extra special at Lindt. Why? They've just launched a Hazelnut chocolate Easter bunny, and has just come onto the market about two weeks ago, as at the time of writing this. 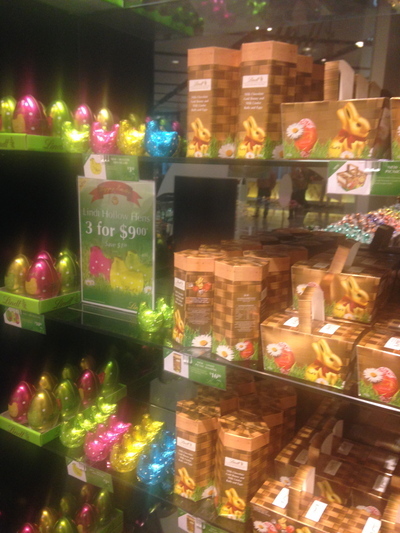 I was impressed to discover a gold wrapped bunny with a green ribbon and gold bell initially at their Martin Place cafe. This was on another chocolate tour the Saturday before last. So glad to have tried it, and the Hazelnut bunny can only be purchased at their pop-up store here in Westfield Sydney, and/or at any of their chocolate cafes. You cannot even buy this product at Food Halls. After trying it for the first time, I came to the conclusion that it was a smart decision for Lindt to launch this product in Sydney as a result of customer feedback last Easter. Love the crunchy, roasted hazelnut pieces blended and scattered within their creamy milk chocolate. Much better than a Ferrero Rocher, and the nutty flavour is strong but not overpowering. They're really generous with the hazelnuts inside. 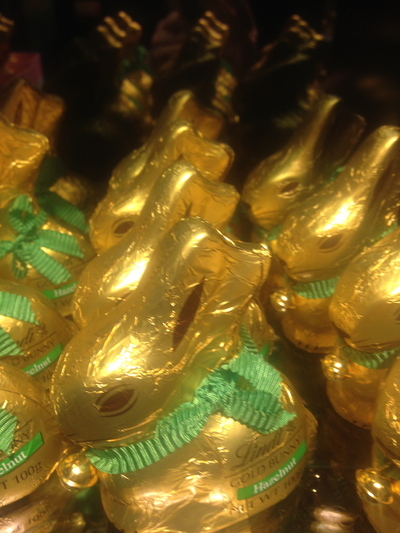 Hazelnut and chocolate lovers, rejoice this Lindt Easter. 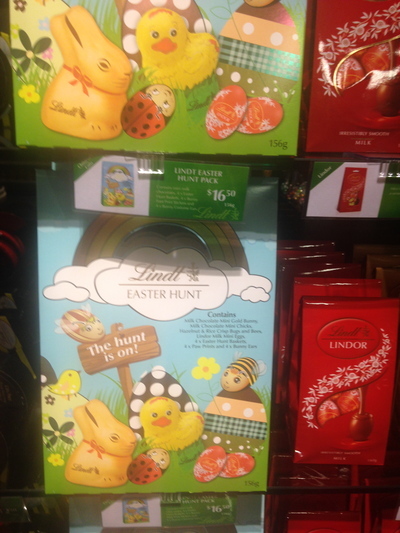 Unfortunately, irrespective as to how well this product goes, Lindt will only be selling them for Easter in 2014. Therefore, consume and enjoy wisely. The cost of importing the nuts into Sydney is high. This product is highly infused with high quality hazelnuts. 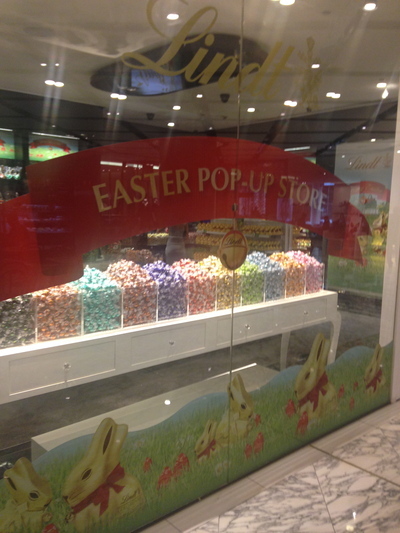 The pop-up feel goes out the window at this Lindt Easter Pop-Up store, currently open at Westfield Sydney. The service is excellent, and as expected, I walked away with two hazelnut Easter bunnies to enjoy. I'll be coming back for more closer to the time to give as gifts to loved ones this Easter. Your purchases come in a proper blue Lindt bag. I am more than comfortable taking all of my guests on my next seven chocolate walking tours, including one on Easter Saturday - that's right for the next seven Saturday's to this place as a bonus stop. Can't get enough of these bunnies. They're multiplying. Where: Level 4 Westfield Sydney, 188 Pitt Street Sydney NSW. Why: Buy two Hazelnut Easter bunnies for only $8. You cannot buy them for that price anywhere else in sensational Sydney! Cost: I spent $8 on my recent visit, and it all depends on you. When: During Westfield Sydney trading hours from Saturday the 1 March 2014 - Monday 21 April 2014. Good for kids: Yes - I think they'll love it in here too. Take away: Yes - that's the whole point.